There are many Blue Ridge Mountains in the Adirondacks (and even on the ADK Hundred Highest list), but the one I chose to hike on Labor Day weekend was the one that lies southwest of Indian Lake in the West Canada Lake Wilderness. It was a hot day but we started early. Leesa joined me and of course our dog Rev. We had camped the night before at a designated site near just off Jessup River Road near Perkins Clearing. The route I chose started out on the Callahan Brook Trail (unmarked herd path) which begins just behind campsite #1 near Mason Lake. We let the campers occupying site #1 that we would be starting our hike there early the next morning. We saw that they had dogs and we didn't want to have all the dogs in a barking contest without them knowing what we were doing there. This route involved one known obstacle; namely the Miami River. I knew we would be able to wade across it since it had not rained in weeks. We were on the trail at 7:30. The herd path was relatively easy to follow. It probably gets hard when fresh leaves or snow are on the ground. After 30 minutes we came to the Miami River. The herd path ends at the river bank. We made the mistake of crossing immediately at the end of the trail. We were able to cross on a small beaver dam, but that only brought us to a marsh surrounded by water. We crossed back over the river headed north along the east side of the river. After perhaps a few hundred yards we found a more substantial beaver dam that did indeed reach the far end of the river. Our only problem was that there was a short wade in the river to reach the beaver dam and Rev refused to swim. She doesn't like it. Anyway, Leesa crossed at this location and I found a nearby spot immediately south where Rev and I could make two shallow crossings to get to the beaver dam and then over. All was good. The first crossing which led to the marsh. The beaver crossing that we used. Looking back at the beaver dam crossing. We lost some time figuring out how to sucessfully cross the river, but we were back in business. 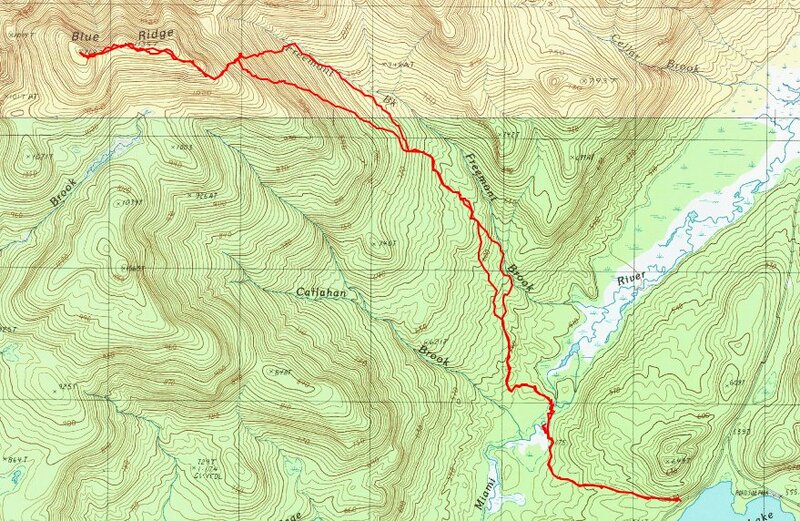 Next, we headed north towards Freemont Brook which would be our guide towards the mountain. We reached the brook at a nice little water hole and Rev gladly succumbed to wading in to lap up some water. My primary reason for taking this route was to explore the 1944 plane wreck site of a C46 cargo plane along the way. This large cargo plane had crashed into the east side of the mountain killing all three men aboard. I like visiting these sites. Its always an eerie feeling thinking of the horrer that occurred at each wreck site. The wreck is high on the mountainside and would not be seen except by hunters or people searching for the site. We had no problem finding it. There were pieces everywhere. Several memorial flags hung from the wreckage and a memorial plaque was affixed to the plane in 1997. Leesa opted to stay at the plane wreckage and poke around while I continued on to claim the summit. I took Rev with me and we took off. 45 minutes later we were on the summit. We passed over a false summit which bore a little thick growth at the far end. A small dip and reclimb and we were on the true summit. 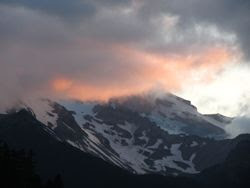 We passed one opening in the trees where we could see the impressive profile of Snowy Mountain to the north. The true summit didn't offer any views and we didn't poke around any further since Leesa was waiting for us back at the plane wreck. We did find an old metal pipe hanger strap at the summit which once held a summit cannister. It now housed an empty beer can. We left the summit and found ourselves back to Leesa in 30 minutes. I was running low on liquids so we had to drink sparingly until we returned to Freemont Brook. In order to reach the brook more quickly, we dropped straight down the mountain instead of the diagonal climb that we had done on the way up. This worked well and we were at the brook in no time. The walk back to the Miami River seemed to take a long time in the heat of the day. Common house flies seemed to be buzzing around us in great numbers and would land on us when we stopped. That kept us moving. After recrossing the Miami River at the same location, the herd path was a nice quick walk out. Looking at the Miami River with the beaver dam in the background. The highlight of this trip for both of us was finding the plane wreck.. In some ways it was like a big geocache; and in fact someone had placed a geocache at the wreck location. That probably brings some additional visitors to the site, although many people may not want to walk that far. We found it well worthwhile.